Avant-garde art is any creation that radically pushes boundaries, challenges the status quo and asks viewers to question their social and political realities. The avant-garde movement has its roots in modernism when it peaked with movements like Futurism, Dadaism and Surrealism. You can find avant-gardism in works as early as Marcel Duchamp’s 1917 “Fountain” readymade that probed ‘what is art?’, and Dali’s early Surrealist works that asked ‘what is reality?’ In the context that the avant-garde movement peaked, those who had the privilege to make art and have it permanently commemorated in art history were nonetheless straight, white males. Recognising the damage this narrow scope has had on art history is London’s October Gallery who first pioneered the idea of the ‘trans-cultural’ avant-garde in the early 80s by showing artists from outside Europe, including Africa and Asia – a radical move for its time. Since 1996, the gallery has created and held shows on what they dub the Transvangarde movement: art that takes the avant-garde out of the Western canon and into the hands of women, PoC and LGBTQ+ communities. The latest installment of the Transvangarde movement is now taking place as an exhibition at the October Gallery until March 3 and features boundary-breaking work from artists all over the globe. Co-founder of Throbbing Gristle, Genesis P-orridge, is participating in the exhibition with the inclusion of their “Snoflakes DNA (Clouds)” (2008) – a mixed media collage collaboration with performance artist Lady Jaye Breyer that deconstructs the fiction of self. The collage uses a ‘cut-up’ method that merges the pair’s physical identities to liberate limits on personal and expressive identity, as the pair become replicated 22 times over as renaissance-style cherubs floating in the sky. Off the canvas, the pair took radical avant-gardism to powerful lengths by merging names and using plastic surgery, hormone therapy, and cross-dressing to merge into a single “panandrogynous” character "BREYER P-ORRIDGE”. Bringing avant-gardism down to the very technique is Brazilian-Russian, Paris born Alexis Peskine who questions the idea of artistic method by painstakingly hammering nails of different lengths with pinpoint precision into wood to generate variations of light. 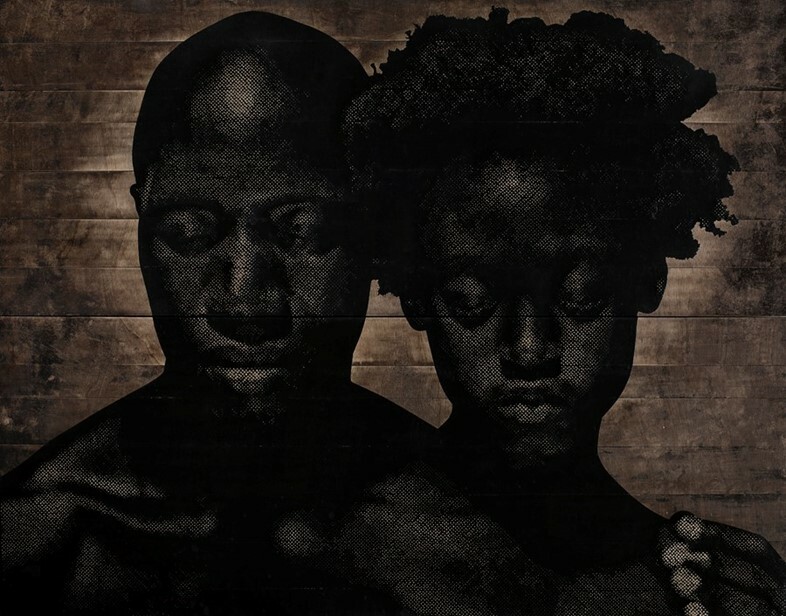 The results are powerful, emotional portraits of strength such as his “Power” (2017) composite that metaphorically links the nail to the black experience. Elsewhere, award-winning late photographer, Daniele Tamagni brings his legacy of striking images that document fashion subcultures throughout contemporary Africa. Transvangarde shows that in a postmodernist time, artists of the trans-cultural avant-garde not only critically fill gaps in art history’s past but ensure that experiences outside the Western canon are celebrated and commemorated for art’s future.